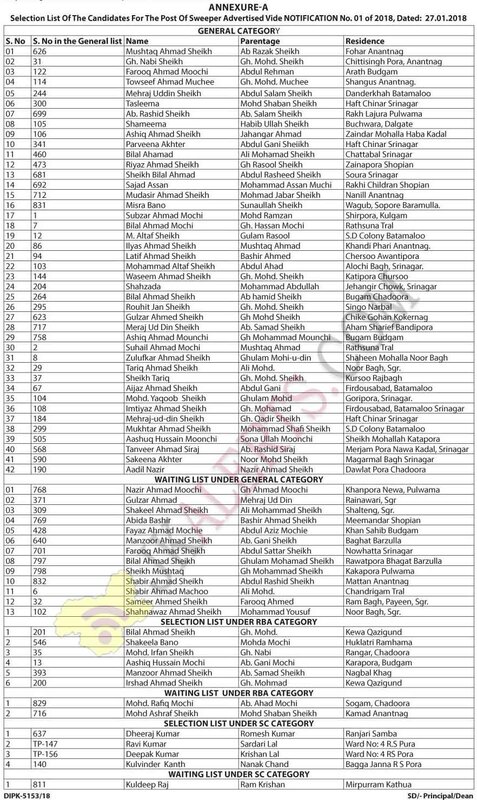 In latest Govt Medical College GMC Srinagar notification Selection list of the candidates for the post of Sweeper is out now. advertised vide Notice No: 01 of 2018 dated: 27.01.2018. Ref: (i) Govt. Order No: 735-GAD of 2008 dated: 30.05.2008. (ii) Govt. Order No: 731-GAD of 2010 dated: 24.06.2010. Now on the basis of eligibility and overall performance in the physical appearance test/interview, a provisional selection/waiting list is hereby notified as annexure”A”to this notification for information of all concerned candidates. The said list is also available on official website of Govt. Medical College, Srinagar i.e. (www.gmc.edu.in). The provisionally selected candidates are directed to report to office of the undersigned within a period of 10 days from the date of publication of selection list along with following documents in original. 5. Reserved category certificate, if any. The mere inclusion of name in the provisional selection list does not confer any right upon the candidates for appointment and the same shall be subject to genuineness/authenticity of the relevant documents.